When you hear the words “cyborg,” or “augmented human,” you inescapably picture Arnold Schwarzenegger as The Terminator, the Borg from Star Trek: The Next Generation, or perhaps The Six Million Dollar Man, if you’re a little older. In Hollywood, any futuristic pairing of man and machine had better be so superawesome, or so superscary, that you’d be willing to spend a good couple of hours (and dollars) being entertained by it. The crazy thing is, even though these images come from a time when technology was barely able to fake the on-screen action, we are now on the cusp of the real thing. We’re entering an age that will enhance who we are as humans in ways that go well beyond these cultural clichés. Here’s where the art and science of human augmentation is today, and a tantalizing peek at where it’s going in the not-too-distant future. Our time as pure, natural humans has an expiration date. Sorry, scratch that. It had an expiration date, and it was about 2 million years ago. It was around that time that we first put technology to use to enhance what we could accomplish with just our bodies. It took the form of a crude cutting tool, and though it might not have been much to look at, it beat the hell out of having to use our teeth for everything. This, according to Super You: How Technology is Revolutionizing What it Means to Be Human author Andy Walker, was the moment the human race became cyborgs. “Any technology that enhances your natural biology and gives you an advantage over somebody else to either survive or procreate is ‘cyborgism,’” Walker says. (Try to force your eyebrows back to their resting position.) His definition likely flies in the face of your lovingly preserved image of Steve Austin leaping over walls in slow motion. Walker isn’t the only one who takes such a liberal view of our cyborgian nature. Ian Harrison, a U.K. researcher whose Ph.D thesis focused on how humans can expand their sensory perceptions through implanted magnets, agrees with Walker. “Human enhancement on an individual level is not anything new, which most people forget,” Harrison says. “It has been going on for centuries.” Walker cites even our most familiar eating and drinking habits as evidence we are enhancing ourselves. Ever chugged a Red Bull or helped yourself to a mid-afternoon coffee to kick your brain back into a higher state of alertness? That’s so cyborg. If all it takes to be a cyborg is to slice open a package from Amazon with a paring knife, well, mission accomplished, right? Of course, there’s more to it than that. While it’s true that our use of tools enhances what we can accomplish with our bare hands (or teeth), humans aren’t the only species that do this. Chimps use small twigs to fish insects out of logs, while the blackspot tuskfish will often smash clams against a rock to force them open. Does this tool use mean that these animals are cyborgs? We need a slightly narrower definition than the one Walker proposes, one that takes the tool out of the hand (or foot, or mouth) and places it inside our bodies, or at the very least, attached to our bodies with a high degree of cohesion — suction cups don’t count. Among people interested in transhumanism and the coming cyborg revolution, one man stands apart. Back in 1998, while at the University of Reading in the U.K., Dr. Kevin Warwick decided to put himself at the center of a set of experiments that he dubbed Project Cyborg. “I wasn’t looking at transhumanism, which I think at that time was really in its infancy,” Warwick told Digital Trends. Instead, he simply wanted to know how we could interact with the signals within our bodies. It started off small, with Warwick implanting a radio-frequency identification (RFID) chip in his shoulder to see how well sensors within his office building could pick up the chip’s presence and respond by turning lights on or off and giving him access to locked doors. “Nobody at that time had tried an implant,” he says. “We thought, well let’s have a go. Let’s try it and see.” The experiment was a success; some say it made him the world’s first cyborg. In 2002, Warwick proceeded to up the ante considerably by having a surgeon implant a device called the BrainGate. With its 100 electrodes, it tapped directly into the nerves of his arm, giving him remote control of a robotic hand. Eventually Warwick was able to establish rudimentary communication not only between himself and a robot, but also with another human being — his wife — who had a less invasive device attached to her own arm. When she tapped on a surface with her hand, Warwick was able to sense it in his own limb. These experiments with cyborg technology led Warwick into an area of research that resonated throughout his career — exploring how we can communicate directly with the brain, for the sake of better communication between people, but also with machines. Knowing this helps to answer one of the biggest questions when it comes to cyborgism: Why? Why would you want to place technology inside your body? It’s invasive, often requiring incisions that can only be made with a scalpel; it risks infection and, depending on the part of the body you’re attempting to modify or interact with, you could cause a great deal of harm. Moreover, gadgets that we can merely hold or wear are improving at an impressive rate. Especially if you are an otherwise healthy human being, why do it? Before we dig in, let’s briefly try to define a few terms. I say “try,” because finding a majority of sources that agree on them is a tricky business. A philosophy that suggests technology will eventually combine with human biology to imbue us with characteristics that are not part of our current definition of what it means to be human. Taken to its logical extent, this will result in a post-human species. In the meantime, anyone who alters their biology through technology is transhuman. Any human who, through the use of technology, augments what they are capable of. As we will see, this term is almost limitless in its scope. The replacement of a body part with an artificial version. “Bionic” replacements may be less capable, as capable, or more capable than the original body part. No distinction is made between replacing a body part lost to an accident or disease, and replacing a body part absent from birth. A robot that looks human. This is only worth noting because, technically speaking, despite being a robot wrapped in human flesh, The Terminator was an android, not a cyborg. Someone who combines technology with biology by embedding it in their body. Would it be cool to know how much electromagnetic radiation your microwave is emitting, or to be aware of the electric beer keg pumps sitting behind the bar at your favorite watering hole, by having the nerves in your fingertips twitch? Maybe. But for Nissan, Harrison’s research sponsor, there was something more, er, tangible being explored. When we’re in a car, the vast majority of the information we rely on to drive safely comes at us visually and audibly. But what if a third sense could be enlisted under very special circumstances to help us react? “When you’re under cognitive load, like driving,” Harrison explains, “tactile input is the fastest method of causing response in the body.” Normally, however, tactile response only works when your body is in physical contact with an object. Harrison’s magnet implants create an invisible bridge between the body and objects that can emit an electromagnetic field. “With my method of tactile input, you no longer have to be in contact with the object,” he says. A cyborg-friendly car could remind you that you’re coming up on a school zone by making your pinky wiggle. You’d be forgiven for thinking that there must be easier ways to achieve the same goals using technology that lives outside the body, rather than inside it. After all, BeBop Sensors recently unveiled a system that can detect and measure a car seat occupant’s weight, forward or sideways lean angle, whether they’re crossing their legs, and whether a booster seat is being used. This data ensures safer airbag deployment, and it is collected without a single embedded magnet or RFID chip. But as sophisticated as external sensors have become, they still can’t fully tap into the “last mile” of a human being’s communication network — our nervous system and brain. “At the moment, we don’t know how to do some of the things without implanting the technology.” Warwick says. “Implanting the technology is a pretty rudimentary thing to do, it’s hitting a nail with a pneumatic drill, so you’re just really hammering the nail.” I start to get nauseous at the idea of being hammered with a nail. News of Warwick’s experiments traveled fast, and his exploits were the topic of dozens of articles, videos, and documentaries. It seems being the world’s first cyborg comes with a certain celebrity status. He wrote of his experiences in his 2002 book, I Cyborg. After he performed the RFID implant, he started getting invites to speak at events for the still-nascent transhumanist community. “They were all philosophers at the time,” Warwick recalls. “They were talking, and for me to come along and say, ‘Well, I’ve actually done this experiment…,’ I don’t think they quite knew what to make of that.” Warwick’s bold move of actually putting technology inside his own body became the starting point for a young and adventurous new arm of the transhumanist community — one that was willing to follow in his footsteps, even if they had to do it without the benefit of trained doctors. These self-styled “biohackers” embraced a DIY philosophy to implanting technology, spurred on by the powerful maker movement, decreasing costs, and expanding availability of off-the-shelf components. Because very few doctors are willing to perform the required incisions, they turn to body-modification artists for the procedures, which are typically done without any kind of anesthetic (to do so is illegal in many countries). “Most people would determine they’re either the crazy nerds from high school or they’re total nut jobs,” says Walker. “But they’re not. They’re highly intelligent people.” Today’s most avant-garde biohackers are pursuing embedded technology with a desire for nothing less than total transformation of the human body, but the first few steps taken were far more modest in their scope. In 2005 — barely a decade ago — Amal Graafstra became the first person outside of an academic or research setting to have an RFID tag implanted. He wasn’t trying to advance the cause of transhumanism, either; he wanted a way to activate security doors when he had his hands full. Unlike Warwick, Graafstra decided to maintain a focus on RFID implants. Now, thanks to two RFID implants in his hands, his mere presence is all that’s required to unlock his car, get into his house, and, naturally, log on to his computer. In 2013, Graafstra became CEO of Dangerous Things, an online retailer of specialized tools and devices for the biohacking community. They turn to body-modification artists for the procedures, typically done without any kind of anesthetic. What came next was a series of experiments that earned Anonym a loyal online following. She inserted various objects beneath her skin using decidedly non-medical-grade gear, including at times a vegetable peeler and, she once joked, vodka for sterilization. That was in 2010, and her exploits inspired a friend to create biohack.me to document her efforts. “When I started, there really wasn’t a biohacking community,” she notes. “It sounds really, really egotistical, but as far as I can tell, I started using that word.” Quirky and charming, Anonym quickly became something of a cult hero to the newly minted biohacking community. Six years after Anonym’s first documented implant, which by her own account went “horribly, horribly wrong,” brave souls with a tolerance for risk and pain are performing and documenting their own biohacks. This “grinder” activity no doubt pleases Anonym a great deal. “Now you can have the same thing as they’ve got,” she says, referring to university-based researchers, “but you can do it with really cheap, off-the-counter stuff and you don’t have to have Kevin Warwick’s pet surgeon to do it for you,” she adds, with just a hint of defiance. “The rate of [technological] change is accelerating,” Walker writes in Super You. “It’s improving exponentially with each successive generation.” For some however, this pace of technological change is nothing more than a tease. It ought to be delivering a world of superhuman abilities in which we have eyes that can see through solid objects, and brains that are capable of advanced computation while being simultaneously connected to the internet (wirelessly, of course). But these visions of the future remain just that: visions. Almost two decades after Kevin Warwick implanted himself, average people are still working with the same tech. For a biohacker like Tim Cannon, that simply isn’t good enough. So Cannon, along with fellow biohacker Shawn Sarver, founded Grindhouse Wetware, a group that is hell-bent on turning the talk about human enhancement into reality. Those physical products O’Shea is referring to aren’t going to give you X-ray vision or a mind capable of out-thinking Stephen Hawking — at least, not yet. Grindhouse’s first experimental product was called Circadia, a device about the size of a deck of cards that could read body temperature and relay it to a smartphone via Bluetooth. In 2013, Cannon had the Circadia implanted in his arm with the help of body modification artists. It was removed a few months later. The company’s follow-up product, the Northstar V1, has no sensors at all. Though significantly smaller than the Circadia, the Northstar lights up a series of LEDs beneath the implantee’s skin, something that body-modders have apparently been asking for. Plans for a consumer version of the Circadia include the ability to monitor blood oxygen, blood glucose, blood pressure, temperature, and heart rate. O’Shea recognizes that the average person looks upon the surgically altered forearms of Cannon and his crew with a combination of disgust, horror, and even fear. “What we are doing at Grindhouse is the Wright Brothers of biohacking,” O’Shea declares, and notes that if you had tried to guess at the significance of powered flight strictly from the results of the Wright’s first efforts at Kitty Hawk, you’d probably have doubts, too. In case you think O’Shea’s comparison is overly grand, consider this: The members of Grindhouse see their efforts as the first of a new industry. “This isn’t the medical industry, this isn’t the body-modification industry for aesthetic purposes, this is something entirely different,” O’Shea says. Harrison worries that all of the media focus that has been given to Anonym and Cannon could easily derail the scientific community’s effort to explore human augmentation through implantation. Specifically, he thinks that the lack of any true scientific method could damage “the credibility of the actual research going on in academic institutes or in industrial research labs.” He’s also genuinely concerned about the health and well-being of those that choose to become garage grinders. Will we ever be bionic? The history of putting tech inside our bodies goes back decades. The medical field now has an impressive array of devices to choose from for fixing an array of maladies. From passive devices like stents, which act as structural reinforcement to arteries, to highly active and configurable gadgets like pacemakers, implanted medical devices are big business — worth well over $85 billion in the U.S. alone. You’d think that by now, we’d have several “bionic” replacement parts that were, in every measurable way, better than the original. And yet, with the exception of prosthetic leg blades made famous by South African sprinter Oscar Pistorius — which according to one study, gave the runner a 25 percent advantage in terms of energy expenditure — our replacement efforts usually yield worse performance than our “OEM” parts. To understand why, let’s look at an implant that has been under development since the 1970s — the cochlear implant. Amy Ng is an audiologist with Sunnybrook Hospital in Toronto, Canada. The hospital has been providing patients with cochlear implants since 1984, shortly after the technology became commercialized. The device’s origins sound suspiciously like biohacking: “A couple of French guys were in a basement, and one decided to stick a live wire in his ear and he heard a sound,” Ng tells us. Since then, the cochlear implant has become one of the few medical devices to serve as a complete replacement for an original organ, in this case, the ear and its associated parts. The implant effectively bypasses the first links in the auditory chain (the outer ear, the ear canal, the eardrum, and all three of the tiny bones that conduct vibration) to deliver audible sound in the form of electrical stimulus directly to the cells that would normally transmit these sensations to the brain. Early versions of the device weren’t portable and required large, external computing resources in order to work. Very few patients were offered the technology. “You had to be literally stone deaf,” Ng says. That requirement was based on two factors. First, because the original implant offered only a marginal signal improvement over no hearing at all, totally deaf patients were the only ones who would notice a difference. Second, Health Canada and the U.S. Food and Drug Administration needed to assess the safety and efficacy of the new implants, so patient groups were kept small. Since then, cochlear implants have improved dramatically. They’re now self-contained, battery powered, fully digital, and capable of transmitting a much bigger range of sound (60 to 8,900 Hz, versus the 20 to 20,000 Hz an average human can hear). But one caveat remains in place for implantation: “We need a brain that has a dedicated area for processing sound,” Ng says. That may seem counterintuitive, especially since deafness is usually not a problem with the brain. But the inner workings of a brain that has never had access to sound are quite different from one that has. “If the brain grew up without ever processing sound,” Ng explains, “without ever learning speech and language, without ever getting information through sound processing, then that brain has reconfigured itself and used that area for other functions.” In other words, a cochlear implant’s stimulation of hearing cells would not be interpreted by these brains as sound at all. Ng concedes that it might be possible to give someone who has never had any hearing the ability to process sounds using the same technique, but it would be extremely difficult for the patient to train themselves. Sunnybrook had just such a patient who was very determined to try — it was an abject failure. “After many months of getting used to it, he was able to get what he calls a hearing sensation,” Ng says. “But, and this is the very big but, he was not able to discriminate when I said ‘ah’ versus ‘sh,’” which Ng claims would be the most basic level of sound discrimination needed to process speech. The patient eventually gave up after a year and a half of training. 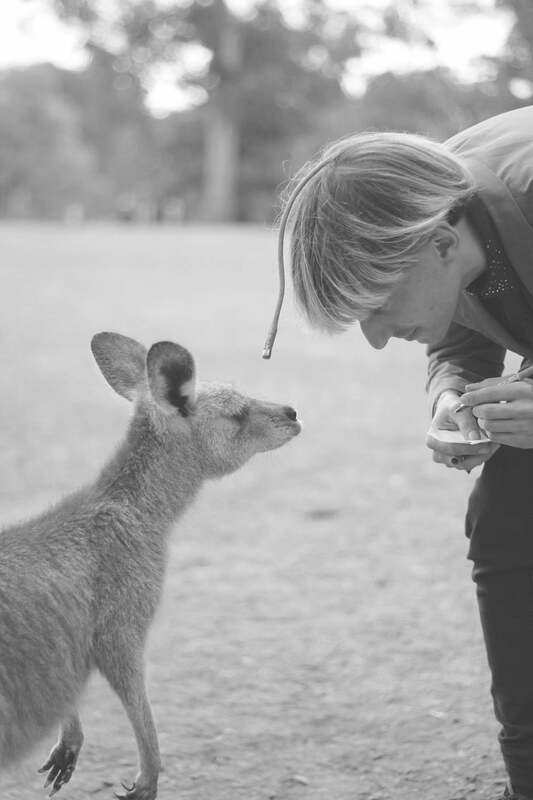 One person determined to topple this barrier is Neil Harbisson. Harbisson was born with an extreme version of colorblindness known as achromatopsia. For most people, this condition would be treated the same as any other disability — something to accept and then work with. But not for Harbisson, who is an artist. In 2004, he had a flexible antenna, known as an eyeborg, surgically (and permanently) mounted to his skull. 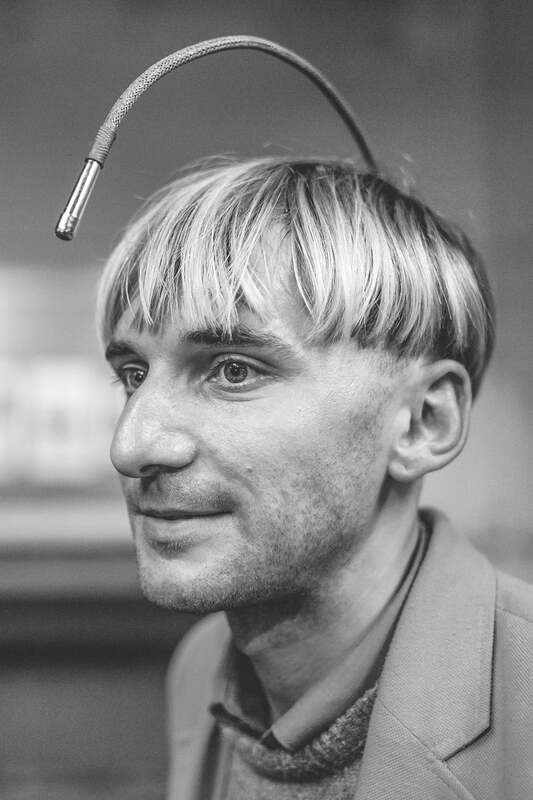 Today, that antenna is capable of receiving a wide range of signals including visible color spectrum and infrared, which are translated into sounds that only Harbisson can hear. 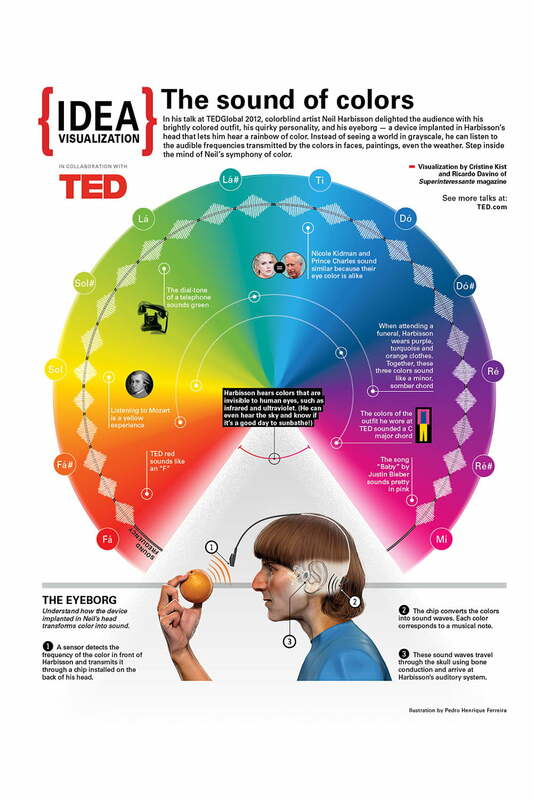 Through the eyeborg, he can paint with colors by matching each color to a memorized sound. Harbisson and Ribas want others to expand their senses in this way, so they’re launching a new device called North Sense, which sends a vibration through your body whenever it’s facing magnetic north. The tiny gadget maintains contact with your skin via two barbell-style piercings, and can function without a smartphone. For Anonym, security concerns take a back seat to what she sees as the real dangers posed by our cybernetic future: A world where today’s economic disparities become tomorrow’s augmentation disparities. As movie-friendly as the implant-ridden cyborg may be, the human race has a much longer history of augmentation via a less cinematic technology: chemistry. Romanian psychologist and chemist Corneliu E. Giurgea, who coined the term nootropic (the use of a drug to enhance cognitive function), was once quoted as saying, “Man will not wait passively for millions of years for evolution to offer him a better brain.” It’s possible he was including cyborg implants in his assessment, but it’s far more likely he was pointing to the promises of chemical manipulation. As a result of his research for Super You, Walker has decided to biohack himself. His reason for doing so has nothing to do with augmentation — at least not in the near term. Instead of using implants, he’s using pills. “You could call me a bit of a pill hacker at this point,” he laughs. At 50, Walker has recently become a husband and father. Unfortunately, his genetic inheritance comes with several potential ticking time bombs: Macular degeneration and, critically, cardiovascular disease. “What I’m trying to do is, for my son’s benefit and for my wife’s benefit, is live a long healthy life.” That’s where the pills come in. Walker is experimenting with a prescription drug called metformin. By pharmaceutical standards, it’s no spring chicken — metformin has been used in the treatment of type 2 diabetes for decades. Walker doesn’t have type 2 diabetes, but he’s hoping that a side effect of the drug will slow his aging. Sort of. Walker’s source of optimism is Dr. Nir Barzilai, a former Israeli army medical officer and aging expert based at the Albert Einstein College of Medicine in the Bronx, New York. Barzilai is spearheading an effort to prove that metformin can increase a person’s life span by decreasing the odds of dying from major age-related illnesses, like cardiovascular disease. It’s not really a longevity-enhancing drug, unless you’re at a high risk of an age-related disease, and in that case, it could just be a miracle in disguise. Once armed with the details of his DNA, Walker hopes to defuse his time bombs via the revolutionary gene-editing technology known as CRISPR-Cas9, or simply CRISPR for short. Because CRISPR is far cheaper, easier, faster, and more precise than previous gene-editing techniques, we may be on the cusp of a golden age of gene therapies as scientists race to understand how it can be used for a myriad of purposes, including the possible treatment of cardiovascular disease. Ng is optimistic on two fronts. She points to the fact that gene therapy and tech implants make for good bedfellows. New research is looking at coating the tips of the incredibly small wires of a cochlear implant with agents that could promote the ability of hair cells to regenerate. If that works, cochlear implants may simply give way to gene therapy as a treatment for deafness. At the same time, work is being done on neuroplasticity that could yield a technique which forces an adult brain back into the learning mode of a toddler. Doing so would offer a pathway to hearing even for those whose brains developed without exposure to sound. Harrison is inspired by his mentor’s work in the field of brain communication. Citing the premise of the Bruce Willis movie Surrogates (2009), in which android bodies are controlled remotely by humans, he says, “If you could take Kevin’s work one step further and you could explore Mars as if you were a being on Mars, and you had all of the sensory array that a human had, being fed back into your nervous system, would you not want to give that a go?” Warwick himself has been quoted as saying that in 10 years, human-to-human telepathy could be realized. “For me, thought communication in some basic form will be enormous,” he noted to Walker in Super You. O’Shea couldn’t agree more. “I would say in the coming years we will get a prosthetic limb that is hands down in all ways better than a biological limb,” he says, but also warns that there will be a social upheaval that comes with this option. Opting to keep your own arm will still be possible, but “if a significant majority the workforce says, ‘Yes, I want that prosthetic limb,’ and they get all the labor jobs, then you get a division of people there.” Of course, that’s assuming the robots will have left us any labor jobs at all. Perhaps we’ll all end up as The Borg after all.